Dive IS was an operator that was recommended to me by various friends. I have loved Iceland since my first visit and was always keen to return to Silfra. 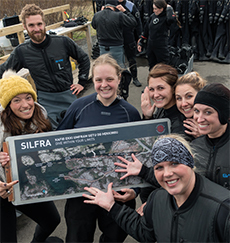 I was also keen to check out as many tour operators as possible to see what the difference is and this time it was about seeing if Silfra was easily accessible by backpackers and non divers. The frustrating thing with amazing dives around the world is when you don't dive. I have lots of friends in this situation, avid travellers who just haven't got round to learning to dive yet and it creates a barrier to some fairly epic places.